An interesting example of how letters were written in earlier times. Presumably to save paper over-writing was done at right angles to the original writing. 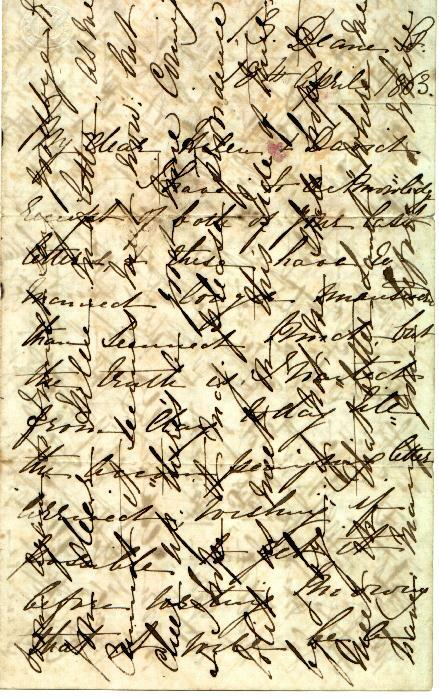 This letter was sent from Bella Phillip (Forrester)in London, Helen's cousin, to Helen and David in July 1863 only a few days before their departure for their new life in New Zealand. You can easily see the address and 'My Dear Helen and David' on page one. The writing at right angles forms page six of the letter. A full translation of the letter is given in the section of the Bowie/Philp story dealing with the departure of the family.